Embedding Counselling and Communication Skills provides step-by-step learning for those looking to gain theoretical and practical understanding of using counselling and communication skills within the helper role and explores how to apply these skills in the context of professional practice. Becky Midwinter and Janie Dickson introduce the reader to a new Relational Skills model which demonstrates the phases of relationship development. The authors show what happens within each phase and identify how and when to use skills appropriately. Learning is brought alive through the use of online unscripted video clip sessions of a real helper/client relationship giving the reader opportunities and encouragement to reflect and evaluate their learning. 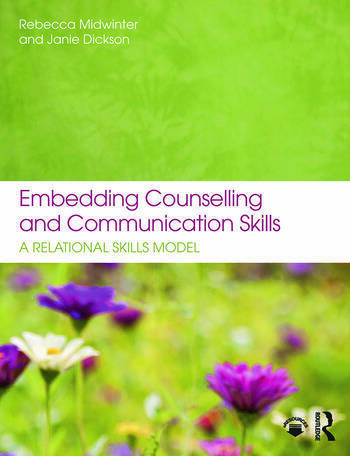 Written in a clear and accessible teaching style, Embedding Counselling and Communication Skills progresses through the ‘initial helper’ communication skills that are used in every day life, to the more complex and in-depth counselling skills required in a helper relationship. Knowledge of reflective practice, aspects of the relationship and how to manage change ensures the text considers the full range of general and specific skills and abilities required in a helper role situation, whilst the supporting online material is an invaluable tool to deepen and embed the theoretical understanding; practical application and self-reflection. This book will be an essential resource for students taking an introductory counselling skills course and qualified professionals who wish to enhance their knowledge of embedding counselling skills into their work and practice. Preface. Introduction. The Skill of Communicating. Setting up the Relationship. Developing the Relationship. Working With the Relationship. The Established Relationship. Maintaining the Relationship. Deepening Your Understanding. Becoming a Reflexive Practitioner. Conclusion. Appendices. Rebecca Midwinter has many years of experience working within the helping professions. She is a Senior Lecturer at Bath Spa University and her teaching career includes her role as Senior Teaching Fellow at the University of Bristol. She is a BACP accredited counsellor/psychotherapist and is UKRCP registered. She has completed her EMDR training and has extensive experience of working within the field of trauma counselling. Rebecca is also the Director of Alpheus Training Ltd.
Janie Dickson is a practising psychotherapist, clinical supervisor, trainer and Honorary Teaching Fellow at the University of Bristol. Originally from a social work background, Janie has extensive experience of working within the NHS. She is a BACP accredited counsellor/psychotherapist and is UKRCP registered. She has completed her EMDR training and currently specialises in trauma therapy.